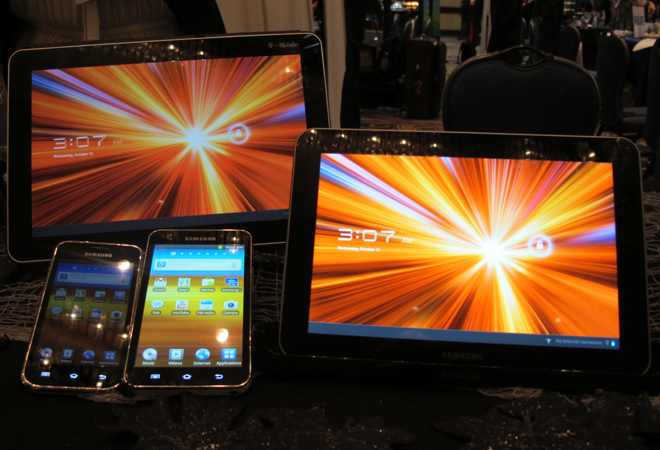 SAN DIEGO — Samsung wants to place a different sized tablet in every pocket you’ve got. You’re probably already familiar with the Galaxy Tab 10.1. It’s a bit larger than Apple’s iPad, and best suited for the outer pocket of your laptop bag. 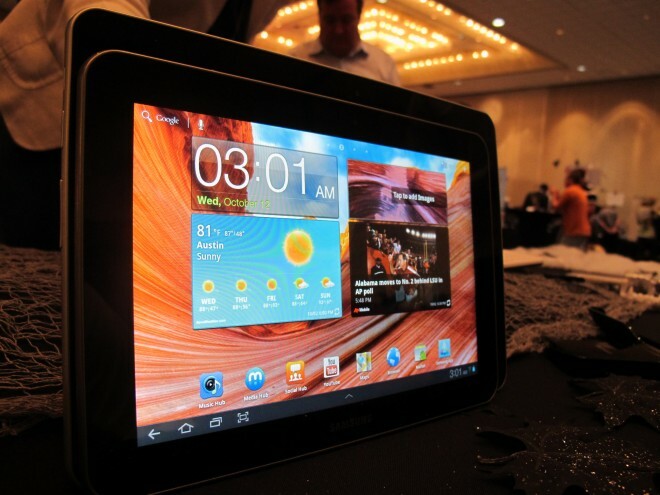 Then there’s the newly released 8.9-inch Galaxy Tab, a scaled-down version of its bigger brother. This one’s good for toting in a trenchcoat or perhaps even a sport blazer. And now we have the yet-to-be-released 4- and 5-inch Galaxy Player multimedia devices, which slide nicely into a pair of jeans pockets. Samsung’s strategy is similar to RIM’s with the PlayBook, and Amazon’s with the upcoming Fire tablet: Smaller form factors will attract hesitant, would-be tablet adopters who haven’t sprung for an iPad. But is a small size and cheap price enough, or must companies like RIM, Amazon and Samsung offer deeper levels of product differentiation? Aside from offering a more totable form factor, the idea behind RIM’s PlayBook is to attract the enterprise sector by playing up RIM’s proprietary security systems and BlackBerry Messenger network — though after this week’s network outages, RIM hardly still has that ace up its sleeve. Amazon, meanwhile, has an entire application ecosystem, extensive media library and its Amazon Prime service to back the Fire. In all, it’s a compelling set of reasons for any tablet newcomer to play with Fire, so to speak. The Galaxy Player devices are interesting, though don’t seem very compelling compared against their competitive set. They’re essentially Galaxy S2 smartphones without the whole phone part. In other words, they’re the Android equivalent of the iPod Touch. So here’s my question: In a market where iPods are going down in sales with the rise of smartphones, why launch a media player? Are people willing to carry two devices, if not more? Microsoft doesn’t seem to think so. And then we have Samsung’s not-so-alluring pricing tiers. Despite its reduction in size, the Galaxy Tab 8.9 costs only $30 less than the Tab 10.1, down to $470 and $570 for respective 16GB and 32GB options. Similarly, the Galaxy Players cost $230 and $270 for the 4-inch and 5-inch versions, respectively. Compared to the iPod Touch, however, the Galaxy Players offer less bang for the buck. For $300, you can pick up a 32GB iPod Touch. The 5-inch Galaxy Player costs a bit less at $270, but comes with just 8GB of storage. If storage isn’t important to you, Apple offers an 8GB iPod touch for $200, while the 4-inch Galaxy Player is $230. Samsung needs to do more with its devices than just switch up their measurements. The adage may be tired, but rings more true than ever: Size may matter to some, but it sure as hell isn’t everything.